Google has released video tours of the various features of its new Google+ social service. This includes the mobile experience as well as Circles, which can help you to share with only the people that you specify and Sparks, which shows you blog posts, videos and articles that you might be interested in. The new Google+ social sharing project was detailed in full by Techcrunch this morning. The project combines several sharing tools together to help you share content, discuss things with friends and upload items that you would like to share. The aim of Google+ is to help you to get more control over who you share things with and how. The main components of Google+ are Circles, Sparks, Huddle, Instant Upload, Hangouts and Mobile. The first major feature of Google+ is Circles, which is a group management tool that allows you to create ‘Circles’ of friends, family and other people that you share with. You can create Circles quickly online and add members of your friends to them. People that you add to various circles will not see content that you share with other ones. This will allow you to share with people based on various bits of information that you know about them, helping you to share content that they will enjoy, without shoving it in the face of other people in your Google+ network that may not want to see it. Google says that this should help people to share more as they can pick and choose who they share what with. Next up is Sparks, a recommendation engine that uses a list of interests that you give Google+ to recommend links and content to you. You can then share those topics with friends in your various Circles, getting input and comments from them. The next feature is called Hangouts and its a multi-person video chat service that allows you to create open chat rooms that members of your Circle can drop into. Google says that this feature combines the ‘casual meetup with live multi-person video. The Instant Upload feature will be integrated into the mobile apps for Android and iOS and will allow you to capture pictures or video which are uploaded directly into your Google+ account. Google has included a feature called Huddle in Google+ that allows you to create temporary groups that allow you to plan gatherings or meetings easier. You can think of it as a sort of group messaging service that can narrow down the amount of people that you’re talking about plans with. This way you can make arrangements to meet up at a certain time with only a few select friends, but without all of the text messaging and calling that normally goes on when you’re trying to get people together. Google+ will be available on mobile devices vi an Android app, a mobile web app and, eventually, an iPhone app as well. 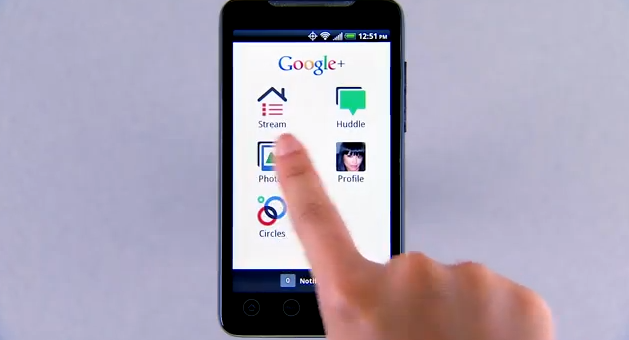 Each of the major components of Google+ will be accessible on the mobile app, including Circles. These features will take advantage of location data to display results that are near you, including the locations of checkins and recommended topics on a Google map view. If you find Google+ intriguing, you can sign up to get an invitation as the network is rolled out here.